Source: http://www.saibaba-aclearview.com/contents2.htm - [Copyright 2001. Dated August 2001. In addition to His role as Incarnation of God, the Avatar is also a Self-Realized Master; in fact, this is the Avatar’s primary qualification. He is the Paramatman, the infinite expanse of pure Awareness in which the whole realm of time and space floats like a tiny bubble - and the Avatar will always be fully aware of His identity as the Paramatman; otherwise He could not be called an Avatar! 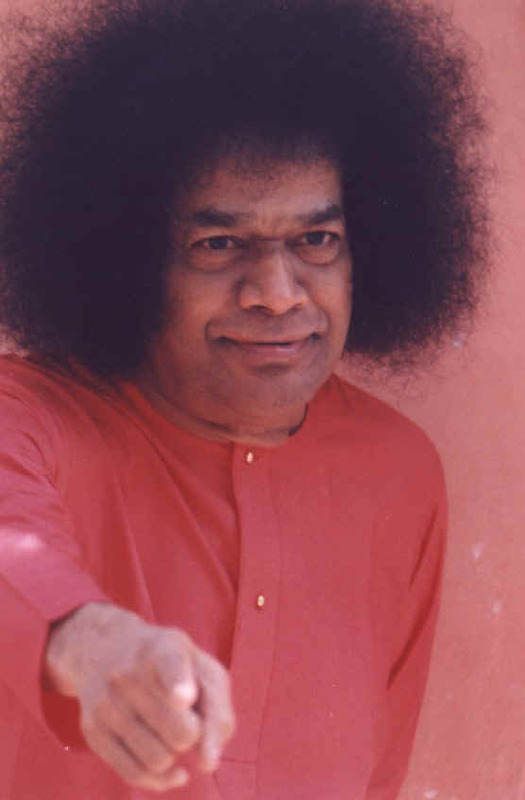 I humbly submit that Sathya Sai Baba, miracles and all, is a perfect Jnani, and fully capable of leading a seeker on the jnana path (or any other path, for that matter) all the way to Self-Realization. "...the night when Ramana Maharshi passed away in Tiruvannamalai [14th April, 1950], I was with Swamiji [Sai Baba]. Krishna [another young devotee] and myself were both there. That evening, around 9:00, we continued whatever it was we were doing (I think we were doing a puja) when suddenly Swamiji looked up at us. There was a peculiar way of looking He has which means that He wants to go to His room. The moment Krishna and I went through the door into the room and closed it, Swami fell down. I was ready for it. Krishna and I both held hands, and Swami was lying across them. Then [He] rose up into the air, from our arms. He was as stiff as a board. He started murmuring - something about 'Maharshi has reached my lotus feet.' And then the sole of His right foot split open, and nearly two kilograms of beautiful, well-scented vibhuti poured out from the sole of His foot. I collected the vibhuti while [He] was still levitating in the air. Then [He] came down and returned to [His] senses and asked what [He] had said. I said, "Swamiji, this is what You said: 'Ramana Maharshi has passed away.' And this is what came out of Your feet." He said: "Put it into packets and give it out as prasadam." So, at the time of his death, Ramana Maharshi merged in Baba's feet! Is it not therefore clear that Sai Baba is a full embodiment of the Divine Self, the supreme Atmic Reality that Ramana had realized at the age of 17? 1 Miracles are My Visiting Cards, Erlandur Haraldsson, Sai Towers, Prashanti Nilayam, 1987, pp. 167-168.